On May 16, 2018, Sharon L. Lechowicz passed away at the Johns Hopkins Hospital in Baltimore, MD. Sharon spent a distinguished career in service to the State of Maryland, holding a number of positions within the Maryland Transportation Authority and retiring as Administrator of the Gov. William Preston Lane, Jr. Memorial Bridge. 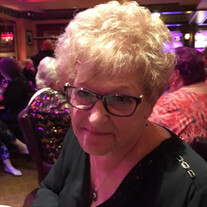 Sharon is survived by her devoted husband of 36 years, Albert R. Lechowicz; beloved sisters, Misty Looker, Linda Hovatter and her husband, Kent; cherished sister-in-law, Nancy Looker; son, Chris Parr; daughters, Tina Lechowicz Elliott and her husband, Bill and Jackie Carr; and many loved grandchildren. Sharon was also fortunate to be surrounded in life by many treasured close friends. Sharon was preceded in death by her loving parents, Evelyn and Edward Looker, Sr., much loved brother, Edward Looker, Jr. and dear sister, Sandra Looker. The family will receive visitors at Singleton Funeral and Cremation Services, 1 2nd Avenue, SW in Glen Burnie on Tuesday, May 22nd, from 3:30 - 7 PM followed immediately by a memorial service. In lieu of flowers, memorial contributions in Sharon's name may be made to Greyhound Pets of America (www.greyhoundpets.org).